Golden Boy Promotions are looking to lock down their fighter WBC middleweight champion Saul “Canelo” Alvarez’s next opponent for his first title defense on May 7th in Las Vegas, Nevada. The two names that Golden Boy are reportedly looking at right now is two-time world title challenger Gabriel Rosado (22-9, 13 KOs) and Willie Monroe Jr. (19-2, 6 KOs), according to bleacherreport.com. By having the 25-year-old Canelo fight one of them, it would give him and boxing fans a chance to see how he does against guys that Golovkin defeated in the past. Monroe Jr. was knocked out in the 6th round in his last fight against Golovkin last year in May; whereas Rosado was stopped in the 7th round by Golovkin in 2013. 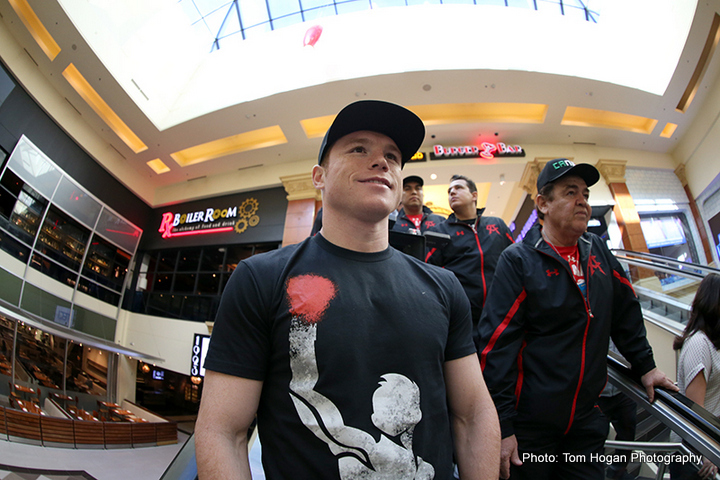 Monroe is ranked #10 by the WBA at 160, and he might be the better option for Canelo. Rosado has won only one fight in the last four years of his career, and that would be something of an embarrassment if he were picked out by Golden Boy for Canelo, especially if the fight is televised on HBO pay-per-view. How do you sell a fight between Canelo and Rosado, with Rosado having won only one fight since 2012? It would be another mismatch similar to how Golden Boy put Canelo in with James Kirkland last May. Kirkland hadn’t fought in two years since 2013, and he was put in with Canelo. Needless to say, it was a terrible mismatch. It goes without saying that Canelo looks good when he’s matched against rusty guys like Kirkland and Alfredo Angulo, and smaller fighters than himself like Miguel Cotto. Monroe wouldn’t be a good candidate for a pay-per-view fight against Canelo. Monroe quit against Golovkin after getting knocked down by him in the 6th round. Afterwards, Monroe said Golovkin didn’t hit as hard as he thought he would. I guess he hit hard enough for Monroe not to want to continue fighting. The only way that Canelo is going to be able to fight on PPV and attract a lot of buys on HBO is if he gets matched against a live body and not fighters like Monroe and Rosado. I can’t imagine too many people wanting to pay to see mismatches involving Canelo and those fighters, can you? Now if Golden Boy matched Canelo against a good opponent like Jermall Charlo, I think he’d have an opponent that could bring in some PPV buys. I’m not talking about the lighter hitting Jermell Charlo. I’m talking about Jermall Charlo. I think Canelo would have a really tough time trying to beat Jermall. However, the PPV buys would likely be very good, and it would be a test whether Canelo can hang with a talented fighter around the same weight as him. Jermall rehydrates to around the 170s. He might not be as heavy as Canelo, but he also wouldn’t be 160+ like Cotto. Canelo would have a real fight on his hands, and I’m not sure he would win. I guess that’s why someone talented liker Jermall would never be considered for Canelo. He’s too dangerous. Previous boxing news: Is Tyson Fury a one-hit wonder?